Purchased for just $36,000 from the Middlebrook Valley Lodge draft at the 2012 Inglis Scone Yearling Sale, promising two year-old filly The Huntress made it two wins in as many starts when taking out the Listed MRC Catanach's Jewellers Stakes at Caulfield on Saturday. Prepared by Mick Kent, the daughter of Husson (Arg) looked good winning on debut at Sandown on April 17 and ran right up to that form in overcoming a bump at the top of the straight to win the 1200 metre dash with some authority for leading rider Glen Boss. Stable representative Craig Arrowsmith was delighted with the performance and revealed interesting plans for the filly. "We bought her at Scone, so it's always been the plan to go back there for the rich race they run for Inglis graduates, so that's where we will be going in three weeks time,” he said. 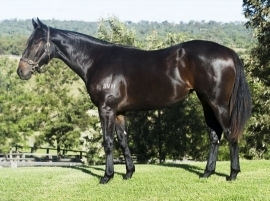 A winner of more than $90,000 in prizemoney, The Huntress (pictured as yearling) is the best of six winners from Western Empress, a half-sister by Western Symphony (USA) to stakes-winner Danaides.